(Clearwisdom.net) It is our belief that when the truth about the persecution of Falun Gong in China has been fully revealed, the persecution will come to an end, since the world will simply not be able to tolerate it. That China’s communist leaders have gone to such great lengths to hide and cover up their actions since 1999 indicates that they believe this, also. Since the Chinese Communist Party banned Falun Gong in China in 1999, the Chinese authorities have utilized a wide variety of mechanisms in their efforts to force adherents to renounce their faith and ultimately wipe out the spiritual group. These strategies have ranged from extreme use of torture and sexual abuse, to the intimidation and harassment of adherents’ family members, to the establishment of a nationwide extralegal task force to implement the eradication policy. The story, almost too dreadful to believe, was first revealed in March 2006, when a woman claimed that as many as 4,000 Falun Gong had been killed for their organs at the hospital in which she had worked. She also said that her husband, a surgeon at the same hospital outside the northeastern city of Shenyang, had disclosed to her that he had removed cornea from the living bodies of 2,000 Falun Gong adherents (article, video). One week later, a Chinese military doctor not only corroborated the woman’s account but claimed such atrocities were taking place in 36 different concentration camps throughout the country. The largest, he said, held 120,000 persons. He said he had also witnessed the Falun Gong being massively transported across the country in cattle trains, at night and under the cover of tight security (article). Shocked by these reports, two prominent Canadian human rights lawyers launched their own investigation. Then in July 2006, former Secretary of State for Asia Pacific David Kilgour and Nazi hunter David Matas, published their own 140-page report. It drew “the regrettable conclusion that the allegations are true” (article). Shortly after reports of organ harvesting emerged, Party leaders announced new legislation banning use of organs without consent. Over a year later, this law does not appear to have been implemented at all, supporting those who claimed all along that the legislation was nothing more than a public relations stunt. Throughout the 1990’s, human rights organizations and international media reported the widespread use of executed prisoners’ organs for organ transplants in China. In 2001, a Chinese doctor testified before Congress, saying he had removed corneas and skin from more than 100 executed prisoners, including ones who were still alive (link to Organs05 – Wang Guoqi, “The preparation for Sujiatun”: http://en.epochtimes.com/news/6-3-30/39868.html article). The Communist Party has now begun employing “execution vans,” which allow for both discrete executions on the go and delivery of fresh organs to hospitals (article). 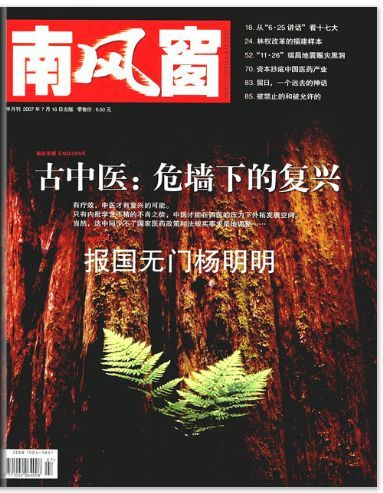 On March 9, 2006, The Epoch Times published an interview with a senior journalist with inside information, who revealed that the CCP had set up a secret concentration camp in the Sujiatun District of Shenyang City in northern Liaoning Province that rivaled those of Nazi Germany. Held in the camp were thousands of Falun Gong practitioners. On March 17, 2006, The Epoch Timesreported an interview with a female witness who worked at the Liaoning Provincial Thrombosis Hospital of Integrated Chinese and Western Medicine. She presented further evidence that the concentration camp was located underground, beneath the hospital. When live organ harvesting took place, her husband at the time, a chief surgeon, participated in removing corneas from living Falun Gong practitioners. 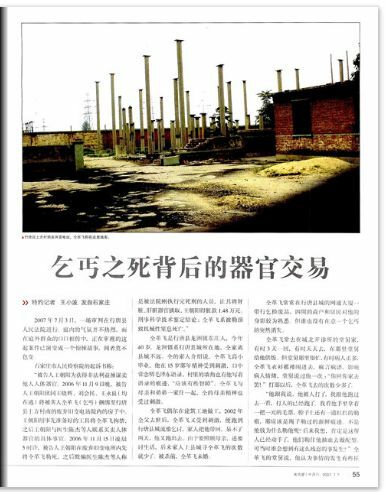 On March 31, a letter from a veteran military doctor was published in The Epoch Times confirming the existence of the underground concentration camp in Sujiatun District, Shenyang City. By then, the dark curtain over the CCP’s live organ harvesting atrocities had been lifted. Following the initial live organ harvesting reports, several overseas organizations started to make telephone investigations. 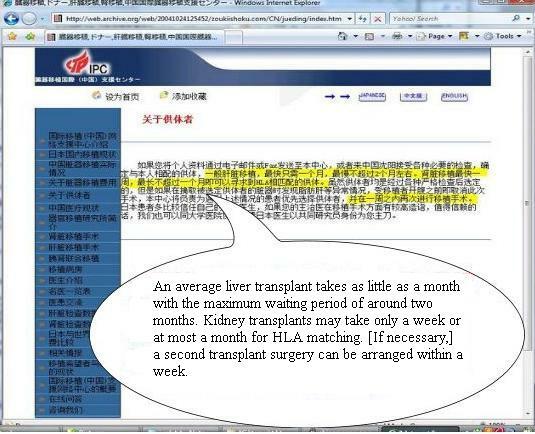 Presenting themselves as people seeking consultations for their relatives who might need organ transplantation surgeries, the investigators called organ transplant sections in numerous hospitals across China. 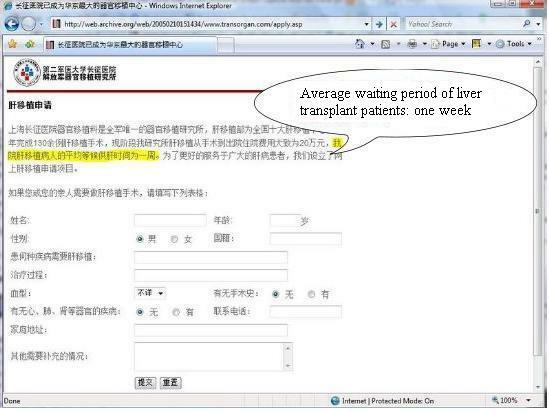 They specifically asked whether the hospitals were able to acquire organs from Falun Gong practitioners. These investigations further validated the allegations that Falun Gong practitioners were killed for their organs. Investigator: Then did your classmate tell you that the [organ transplantation] operations they performed were all [with organ sources from] Falun Gong, is that right? Doctor Lu: Some are from Falun Gong. Some from families of patients. Investigator: Oh. Then if I want to find this type for my child, this type [of organ] from Falun Gong, do you think he can help me find any? Doctor Lu: He definitely can find it for you. Investigator: From prisons? And it was from healthy Falun Gong practitioners…? Doctor Lu: Correct. We could choose the good ones because we assure the quality in our operations. During the investigation, World Organization to Investigate the Persecution of Falun Gong (WOIPFG) investigators contacted a broker representative of the Chinese People’s Liberation Army No. 307 Hospital in Beijing, in the name of helping family members and friends to find suitable kidneys for their transplant requests. The contact lasted for several weeks and the conversation time totaled several dozen minutes. WOIPFG has compiled a complete record of the conversations and other forms of evidence. If any interested organizations or individuals need further information, please contact WOIPFG. This report will be updated as new evidence becomes available in the future. Investigator: then you go ahead and help me check it out, whether…. PLA No. 307 Hospital Representative: I told you before, didn’t I? I told you before that we told you the real story, we have done two cases. You know, we did two cases. Investigator: You mean two operations involving Falun Gong practitioners as source? PLA No. 307 Hospital Representative: That’s right, we did two cases. The prison told us they did that with Falun Gong. I also told that lady that we indeed performed such operations. Now, however, it is getting more difficult than before. Investigator: Where did you find the kidney sources before? PLA No. 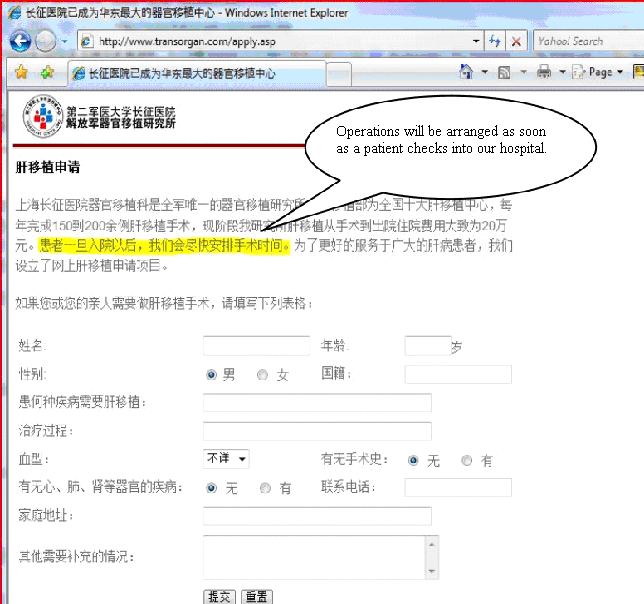 307 Hospital Representative: From Xicheng District [in Beijing]. Investigator: Alright, besides it, how could you be so sure he (the source) was a Falun Gong practitioner, did you find out for sure? PLA No. 307 Hospital Representative: How to positively identify as Falun Gong practitioner, well, when the time comes — when the time comes our side, our Boss will have people showing you information, you know, he will show you the information and data, you can be sure. On April 28, a Sound of Hope journalist made contact with Li Honghui, director of the Kidney Transplant Department, Yuquan Hospital, also known as No. 2 Affiliated Hospital of Tsinghua University. Li admitted that organs were taken from Falun Gong practitioners. 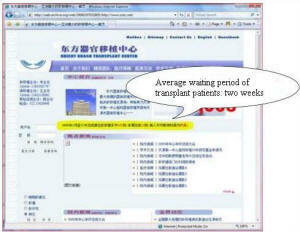 Li Honghui: It happened that for the past several years that donor organs were from Falun Gong practitioners. Investigator: Do you mean that this type of donor was quite easy to get several years ago? On November 17, 2006, Yediot Achronot, Israel’s largest newspaper, reported that four men accused of pocketing millions of dollars that patients had paid for organ transplants were arrested in Israel. Yaron Izhak Yodukin, CEO of Medikt Ltd. and his associates, faced charges of not reporting incomes earned by mediating organ transplants for Israelis in China and the Philippines. The arrests followed months of investigation after the main suspect admitted to an Israeli newspaper that the organs were coming from Chinese death row inmates and prisoners of conscience, including Falun Gong practitioners. In November 2009, Seraphim Editions, a Canadian publisher released a revised, book form of Bloody Harvest: The killing of Falun Gong for their organs. This is the third edition of the investigative report by Matas and Kilgour. It now lists 52 different elements of evidence. Mr. Kilgour pointed out that although no element of evidence alone can prove the crime of live organ harvesting, all of the evidence combined almost irrefutably proves the allegations. Over the years, the process of harvesting organs from living Falun Gong practitioners evolved. The initial alleged cases of organ harvesting occurred on those practitioners who died in forced labor camps as a result of torture. 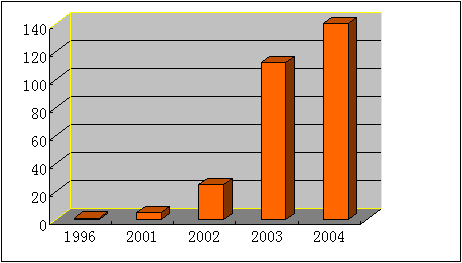 As early as 2000 there were reports of death cases related to organ harvesting. 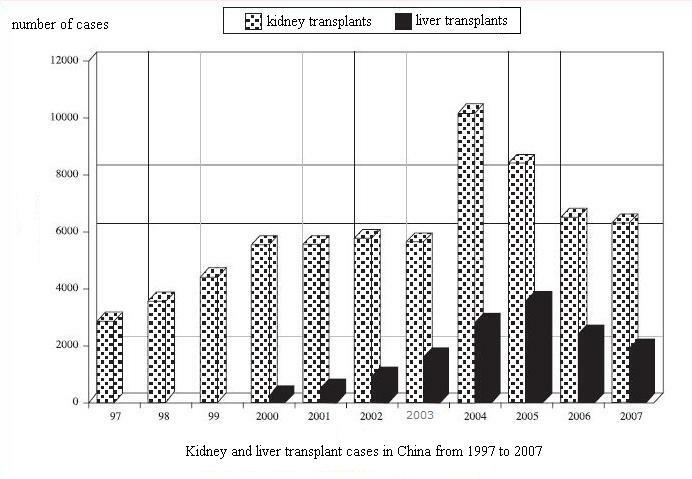 This could explain why the number of organ transplants in mainland China began to increase in 2000. 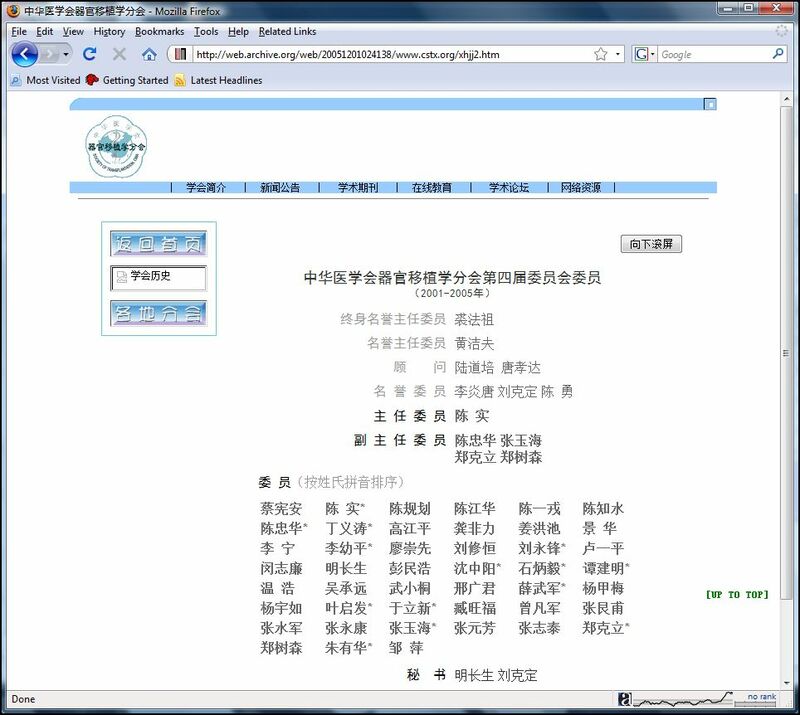 On December 22, 2000, the Minghui/Clearwisdom website posted the following news from China: “According to insiders, some police officers in Mainland China are plotting with doctors and looking to sell the organs of Falun Gong practitioners for huge sums of money.” “One source indicates that a certain hospital in the city of Shijiazhuang specializing in Chinese medicine has received six such requests.”  This might have been the earliest report of the CCP’s organ harvesting from Falun Gong practitioners. We have discussed in previous sections that many practitioners who refused to reveal their names or addresses were detained in undisclosed locations. These military-controlled concentration facilities provided the physical conditions needed for large-scale, live organ harvesting. 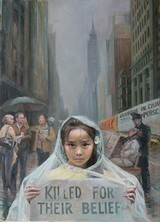 The persecution of Falun Gong was initiated by Jiang Zemin, who mobilized the entire state apparatus in his campaign. 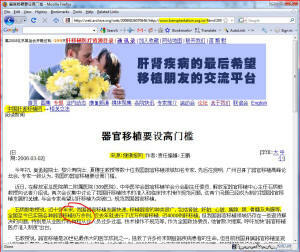 The 610 Office adopted a policy to “defame their reputations, bankrupt them financially, and destroy them physically” in an attempt to eradicate Falun Gong. This policy was never communicated as a written document. The outside world learned of this through practitioners who were detained in the brainwashing centers, forced labor camps, or prisons. 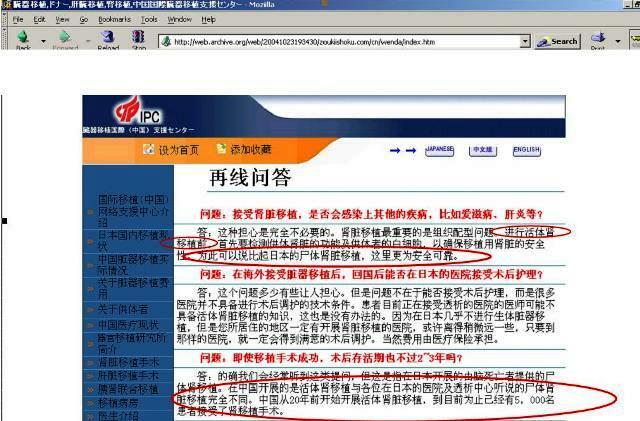 Many of them stated in articles published on the Minghui website that, while in detention, they had heard the police or 610 Office personnel mention this policy. A derivative of the policy is “beating them to death counts as suicide,” another common practice of some police officers in dealing with practitioners who refuse to give up their beliefs. Although the number of death cases of practitioners who died as a result of the persecution continues to grow (by 2009, at least 3,300 practitioners are confirmed to have died), the police officers responsible for these deaths were never punished by the CCP regime. On the contrary, they were recognized as model officers of the anti-Falun Gong campaign and rewarded with promotions and financial incentives. As stated earlier, expensive fees make organ transplants tremendously profitable, which is a powerful motivating force, particularly in an officially atheist country. Since the beginning of the persecution, the CCP regime has fabricated countless lies to slander Falun Gong. A typical example is the “Tiananmen Self Immolation,” staged by the CCP regime in an effort to instigate nationwide hatred of Falun Gong. Live organ harvesting is part of the physical genocide of Falun Gong practitioners, driven by this hatred and the temptation of financial gain. The CCP’s overwhelming deceptive propaganda indeed instigated hatred among the general public in China, paving the way for those who participated in the live organ harvesting of Falun Gong practitioners several years later, but who otherwise may have refrained out of moral concerns. It was the persecution by the CCP and the huge financial incentives that drove the individual cases of organ harvesting to large-scale live organ harvesting. According to insiders, large-scale live organ harvesting of Falun Gong practitioners began to surface in late 2001. At present, there are still a large number of Falun Gong practitioners detained in the hundreds of forced labor camps in China. Many reports published on the Minghui website reveal that families of those who died from torture could not see their loved ones’ bodies, which were forcibly cremated by the police. We have enough reason to believe that organ harvesting still continues on practitioners who die from torture, and it will not end until the persecution stops and all detained practitioners are released. If China had an organ donation system as many western countries do, and if there had never existed the practice of organ harvesting from death row inmates, then the allegations of live organ harvesting from Falun Gong practitioners might indeed seem far-fetched. However, organ harvesting from death row inmates has been in practice for several decades. Some executed death row inmates were not completely dead when their organs were removed. Their cases were close to live organ harvesting. With this as a backdrop, and after the CCP regime labeled Falun Gong practitioners as “enemies of the state” ( a worse situation than that of death row inmates), moving from “using death row organs” to “live organ harvesting from Falun Gong practitioners” was but a small step. In Bloody Harvest, The killing of Falun Gong for their organs, one of the authors, David Kilgour, interviewed Annie (pseudonym), the ex-wife of a Chinese surgeon who removed corneas from Falun Gong practitioners. According to Annie, her ex-husband began to take corneas from Falun Gong practitioners at the end of 2001. His hospital was only responsible for the removal, not the transplant. He was a neurosurgeon but was asked to remove corneas. Before being pushed into the operating rooms, the Falun Gong practitioners were given an injection to cause heart failure. Initially he did not know these living people were Falun Gong practitioners. In the beginning, fearing information could leak out, different organs were removed by different doctors in different rooms. Each time after the surgery he would receive a large sum of money, and given cash awards several dozen times his normal salary. Later on, as the doctors continued to get money, they no longer feared repercussions. They started to remove the organs together. During one operation when he collaborated with other doctors, he learned that the bodies were Falun Gong practitioners. Annie learned this information in 2003. Later that year they divorced. We can see that the customary practice of harvesting the death row organs played a key role in live organ harvesting from Falun Gong practitioners. With the policy of “beating them to death counts as suicide,” plus the deceptive and slanderous propaganda against Falun Gong, doctors became insensitive towards the “donors,” treating them as death row inmates. 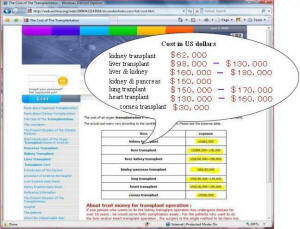 Based on information provided by Annie, the following diagram illustrates the flowchart of live organ harvesting. Different parties are involved in different steps, as seen on the flowchart. The doctors who perform organ harvesting may or may not be the ones who do the organ transplant surgeries. Therefore not every doctor is likely to know the whole picture. If asked where the organs come from, different doctors may provide different answers due to their involvement at the different steps in the process. More importantly, given that the source of organs is controlled by the military, it is very difficult for the outside world to know the entire procedure. 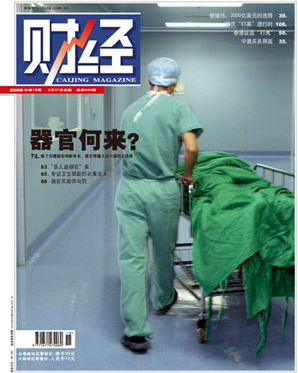 From what we have learned, the common mentality of most organ transplant surgeons in China is that they are unwilling to ask questions about the true identities and backgrounds of the donors. The more surgeries they do, the more money they make, the better they get recognized, the more research papers they can publish, the faster they get promoted, and the less they want to learn about the source of organs. They do not have any qualms as long as they can make themselves believe that the organs were indeed from death row inmates. They follow the process to perform surgeries and do not give too much thought to whether the donors are indeed death row inmates or Falun Gong practitioners. As a result of CCP brainwashing, the military police have treated Falun Gong practitioners as mental patients or death row inmates. Doctors who performed organ harvesting chose to believe that the donor lying on the operating table was a death row inmate, even if the donor was still alive, since they were accustomed to harvesting organs from executed death row inmates who were not completely dead. Doctors who did not participate in organ harvesting but performed organ transplant surgeries were more likely to believe that the organs they received were from death row inmates instead of Falun Gong practitioners. In Annie’s ex-husband’s case, he initially believed that the donors were death row inmates. By the time he learned that they were Falun Gong practitioners, he had become indifferent and was driven by the desire to make more money. Since death row organ harvesting has become a common practice, participants in the live organ harvesting of Falun Gong practitioners tend to treat them as death row inmates. Yet, those Falun Gong practitioners whose organs were harvested alive are not traditional “death row inmates.” Live organ harvesting amounts to cold-blooded murder. As the truth became known, out of fear, those participants decided to keep silent, and this has added to their crimes. It is a good thing for a doctor to be so committed, and there is nothing wrong with pursuing success. However, when a doctor is addicted to organ transplants and has to do several surgeries a week to get satisfaction, all he will care about is how to get endless organ supplies. In that case, how many of them would care whether the donors are death row inmates or Falun Gong practitioners? 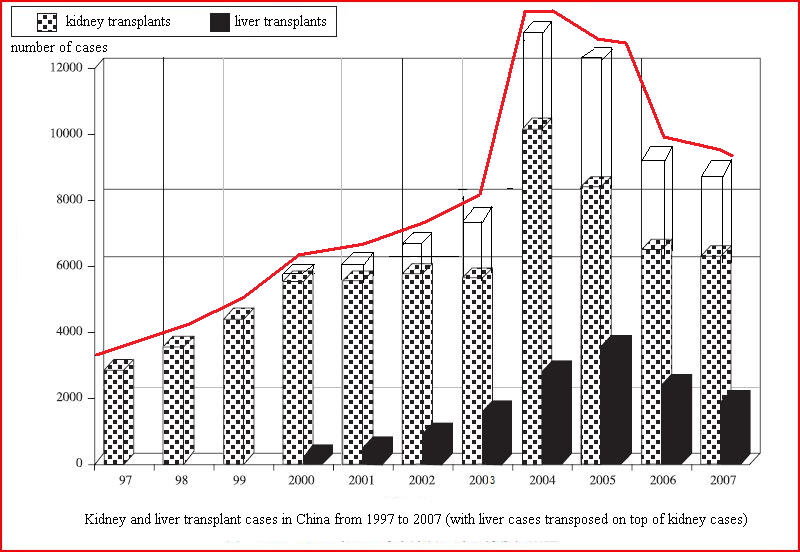 The following graph depicts the environment and conditions under which live organ harvesting could exist. Karl Binding and Alfred Hoche, Die Freigabe der Vernichtung Lebensunwerten Lebens (Allowing the Destruction of Life Unworthy of Life), 1920. Robert Jay Lifton, The Nazi Doctors: Medical Killing and the Psychology of Genocide, 1986.